Sunday, we celebrate Andie’s eleventh birthday! 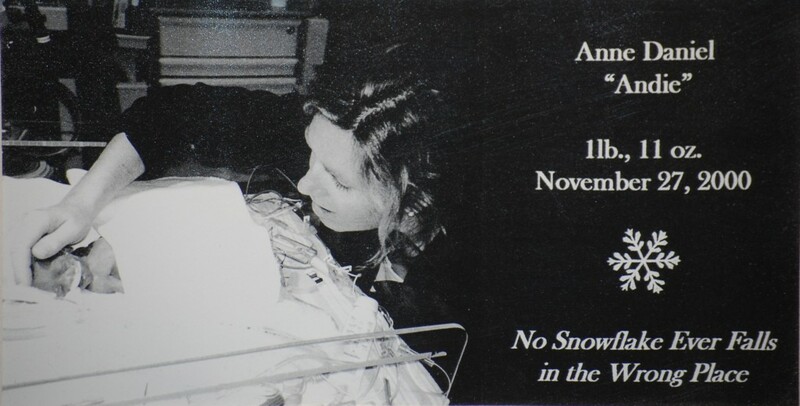 Yesterday, I received an email from a woman who’d been born at 28 weeks, thirty-six years ago! Her parents had been told there was little hope their baby would live. Today, she’s earning a nursing degree and hopes to work in the NICU, helping preemie babies like herself! How’s that for full circle? When Andie was born I had been so uncertain of so many things. Do we grieve? Do we celebrate? I knew for sure I didn’t want any photos taken of her in those first few days. I’ll be eternally grateful to my sister-in-law for convincing me otherwise, allowing her to bring in a camera and take just a few. Those photos are so precious to us all. They helped me see that yes, we should celebrate our daughter’s arrival. That she’d come, not when we expected, but still, she deserved the same welcome we’d given her full-term brother two years prior. The photos inspired us to make a birth announcement. Lee and I wrote it together. It was our holiday card that year. Many friends report that they still pull the card out every year and wonder at the memory. One friend still has the announcement hanging on his refrigerator! I’d been so scared, so uncertain about everything. But writing that announcement brought a certainty I hadn’t felt until then. It was a way of saying, Our daughter has arrived and she’s really something! Look out world here she comes! And believing it was true. “From the bottom of our hearts, we want to thank all of you for your overwhelming love, support, kindness and prayers. It has been simply amazing. Andie’s early arrival certainly came as a shock to us all. To our question ‘Why?’, we have been offered few medical explanations. Yet, we have found many reasons that are so clear to us. We have discovered: how much love, kindness and support exists in our world; that no matter how much we try to plan and control our future, much is out of our control; that prayers and positive thoughts really do work; that a baby born at 25 weeks can grow into a healthy child; and finally, that angels reallydo exist! We continue to learn new lessons each day. The card was meant as a way to thank all those supporting us and properly announce Andie’s arrival. Looking back now however, I see that we were setting our intentions and declaring to the world that our girl was here to stay! How about you? Have you ever celebrated something that you felt uncertain about? Did you send out an announcement when your baby was born? The Breath of Life (or Growing a Sequoia in NH) Birthdays and a Book Giveaway!